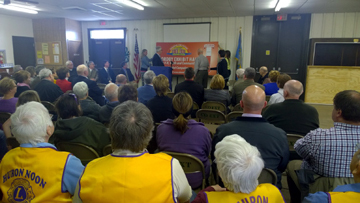 At a recent press conference, the South Dakota State Fair Foundation announced that Earl Nordby from Huron has given a gift of $1 million to the Capital Campaign for the building of a new exhibit hall on the South Dakota State Fairgrounds. The new exhibit hall will bear his name: Nordby Exhibit Hall for 4-H, Youth and Community. The Foundation has raised $2,255,000 million of the $4 million goal. Paul J. Strawhecker, Inc. has provided consultation for the capital campaign. The new 46,910 square-foot exhibit hall will feature more than 35,000 square feet of exhibit space, multiple classrooms, a large kitchen for 4-H Special Foods competitions, year-round concessions and a performance stage. Those interested in supporting the Capital Campaign should contact the State Fair office at 605.353.7340 or visit www.sdstatefairfoundation.com.